I spent most of the long weekend playing WoW. I’ve been grinding away for a while trying to get The Loremaster achievement and after some massive questing, it’s mine! Thanks to awesome guildies who came through in a pinch to help me finish out some group quests I just couldn’t solo. Yay for friends! But all the questing has taken it’s toll, I’m seriously WoWed out. So I took a break last night and did a little shopping and picked up this stunning new ensemble from Silent Sparrow. I agonized over the color choice.. but in the end, purple won out! One of the things that really stood out for me is the slightly worn and dusty edges to the skirt, such a neat little detail. Yeah, my picture is kinda dorky, blame it on my being up all night and not exactly super lucid. 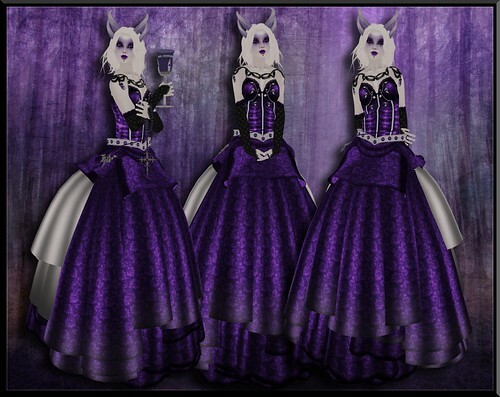 This entry was posted in Fashion, frickablogs, Pictures and tagged Ritual, Silent Sparrow, ~silentsparrow~. Bookmark the permalink.